NB: Linked in Friday's Forgotten Books, 19/4/13. Even though the signature does appear to be genuine, so either the number got forgotten for this copy, or Highsmith ended up signing more than 150 of the buggers. 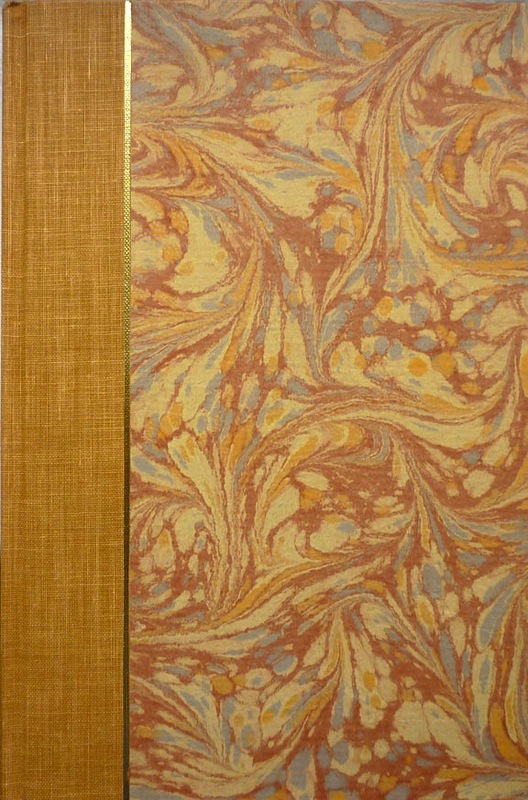 I missed out on an eBay auction for another copy over a year ago – as a consolation prize bagging a terrific signed and inscribed first edition of Little Tales of Misogyny instead – so when this one popped up on eBay, I made damn sure I secured it (as it turned out for under half what the first copy went for). 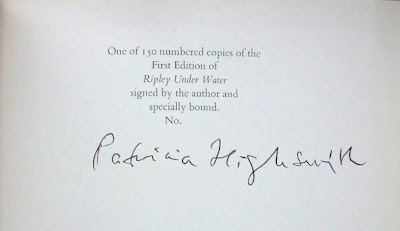 Anyone who's been following this series of posts will hopefully understand that for me, owning a signed Ripley novel is quite something, especially since the cheapest copy currently listed on AbeBooks is £135 (plus postage from America). Although the four Ripley novels which follow The Talented Mr. Ripley (1955) are, loosely speaking, sequels, most of them aren't sequels in the sense that they pick up on plot threads from previous books. The exception is this fifth and final entry in the series, which is a direct sequel to the second book, Ripley Under Ground (1970). Set five years on from that novel – in the mutable timeline of the Ripliad, that is, which means the presence in the narrative of slightly incongruous-for-1975 things like CDs and microwave ovens – it finds Tom besieged by an unhinged American couple, David and Janice Pritchard, who have moved into a house in the area of rural France in which Ripley resides. The Pritchards – David especially, but also Janice – are digging into the death of the art collector Thomas Murchison, who, you'll recall, Tom murdered in Under Ground in order to keep Murchison from revealing that Tom and his English cohorts Ed Banbury and Jeff Constant of the Buckmaster Gallery were up to their necks in an art forgery ring. Having got wind of this from Cynthia Gradnor, the one-time girlfriend of the artist doing the forging, Bernard Tufts (standing in for the deceased Derwatt), David Pritchard is now seemingly intent on finding the corpse of Murchison, which Tom, enlisting the aid of the aforementioned Bernard (who also subsequently died), deposited in a local river. 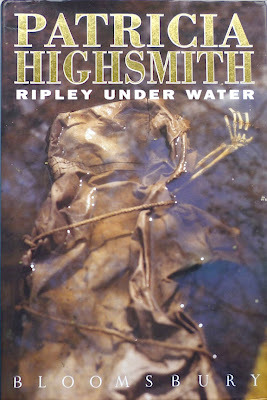 All of which is explained piecemeal by Highsmith for those who haven't read Under Ground, but even so, unlike that and the other Ripley sequels, with Under Water, it helps enormously here to have read the book it references. Which isn't to say there aren't references to other parts of the Ripliad too. For instance, one of the methods David Pritchard employs to unsettle Tom is prank telephone calls from someone purporting to be Dickie Greenleaf, the first of Tom's multiple victims (killed, of course, in The Talented Mr. Ripley). Dickie is perhaps the only one of Tom's murders that he feels any kind of remorse for – "The beginning of his troubles", as Tom reflects after the first call: "The first man he had killed, and the only one he regretted killing, really, the only crime he was sorry about." Though he's certain that Dickie is in fact dead, that initial phone call makes Tom physically sick – an atypical response from the usually in-control Ripley. The presence of an existential threat for Tom makes for a welcome change from the previous book in the series, The Boy Who Followed Ripley (1980), in which Tom's role was often quite passive. 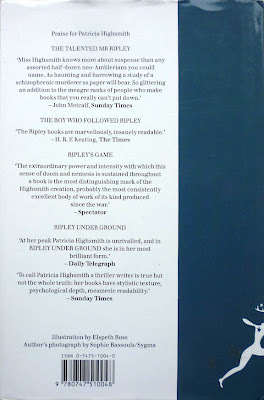 Highsmith's original idea for what would be her last Ripley novel (she died in 1995) was "Ripley touches madness" (jotted in one of her notebooks, as revealed in Andrew Wilson's 2003 biography Beautiful Shadow), and elements of that notion do make it through to the finished novel: when David Pritchard – or "Prickard", as Tom's wife, Heloise, repeatedly mispronounces it, causing Tom to drily correct her ("Pritchard, dear") – follows Tom and Heloise to Tangier, Ripley lures him to a coastal cafe and beats him up, only just keeping from killing him. By and large, though, Tom acts no more crazy than at any other point in the Ripliad, and considerably less so than in Ripley Under Ground, where he struggled to keep a grip on the freewheeling insanity he'd unleashed. Of course, Tom is unhinged; at one point, in reference to Pritchard, he muses that he doesn't understand cracked people (the one exception being Bernard), when in fact he himself is by any definition, to put it mildly, highly abnormal: a conscienceless serial killer. Highsmith is performing her usual trick here of never deviating from Tom's viewpoint, so that we unwittingly empathize with him and Pritchard becomes the villain of the piece. In reality, they're as bad as each other; indeed, Pritchard nails Tom when he calls him a "snob crook". 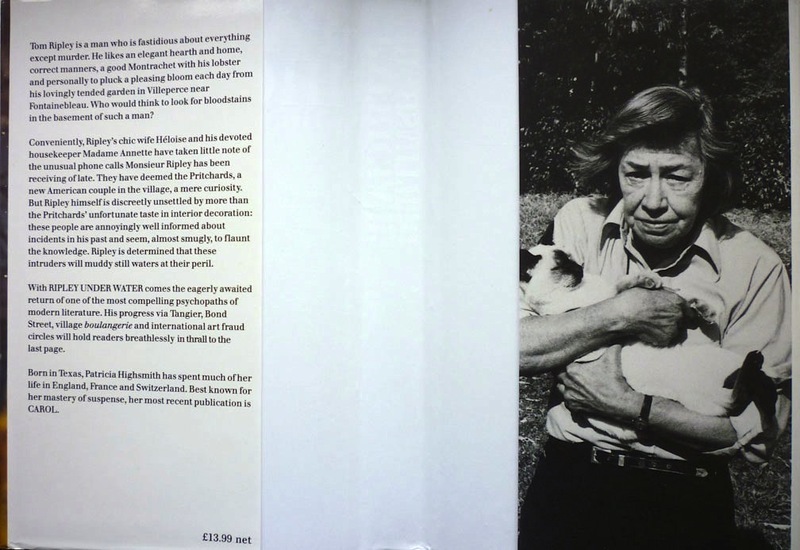 There again, Tom does display some of his more admirable qualities in the book as well. His relationship with Heloise is never more touching than it is here: he twice tells her he loves her – an unusually forthright declaration from the normally reticent Ripley – and a postcard from her makes "his heart jump". 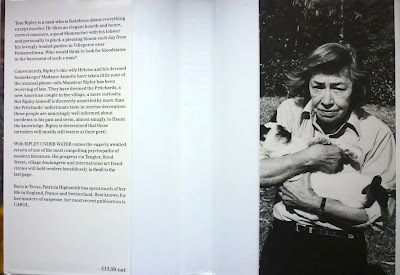 (The only hint of his latent homosexuality this time comes courtesy of his reading a biography of Oscar Wilde – in the previous book he was reading Christopher Isherwood – but even there, that was the book Highsmith herself was reading whilst writing Under Water.) Meanwhile, his loyalty to Ed and Jeff, and theirs to him, seems to go beyond simple self-preservation; when Ed volunteers to come over to France to help thwart Pritchard's "anti-Ripley game" (nicely done, Ms. Highsmith), he apparently does so out of genuine friendship. Still, let's not get too carried away. Ripley is still, as Cynthia Gradnor puts it, "the most evil man I've ever met", adding: "if you consider that a favourable distinction. You probably do." He does some pretty despicable things in Ripley Under Water, not least of which being his gruesome "autopsy" of Murchison's remains when they're delivered by David Pritchard to his house, freshly recovered from the river, complete with "bits of flesh... pale and flabby, [stuck] to the spinal column" – a scene which recalls the similar desecration of Bernard Tufts' corpse in Under Ground. As for Tom's opportunistic solution to the Pritchards' meddling, in its own way that's as cold and calculating as any other of his actions across the Ripliad. I'd definitely rate it above 'The Boy' but below the other 3. A shame though that another one wasn't written - as I recall this one ends on something of a cliff-hanger, with Tom by no means in the clear. Have enjoyed reading your re-read. Thank you, Chris (2). And you're right in that there is a little jolt at the end of Ripley Under Water, but (spoiler alert) it is resolved in short order, leaving Tom free and clear.